For all my Koigu-related whining, this little beret turned out pretty good, don’t you think? Yarn: Koigu KPM, color #1160, 2 skeins. Needles: a variety of US 3 dpns and circs, all Susan Bates. As I mentioned earlier, the trick to making this yarn work for me was to knit it at a looser gauge. Once I grabbed my US 3 needles, the fabric was nubbly and drapey and wonderful. I did have to knit the ribbing on US 0 needles, however, to make sure the beret stayed on. I also opted to use the tubular cast-on for a smooth and seamless start. I had a bit of trouble figuring out how long to make the “body” of the beret. The minimum suggested (3″) was far too short; 4.5″ ended up being too slouchy after blocking. I think 3.75″ was just about right, and the beret was about 11.5″ in diameter on a flat surface. The beret was intended for a friend, and I hope she likes it! Honestly, it’s about time the Koigu and I parted ways – it’s been two years and many false starts. So long, richly-colored and fabulously-textured friend! Wow! Not only is that a beautiful beret, but I am the first one to post a comment. I hope your friend enjoys your wonderful gift. Love the beret. It is quite a gorgeous color. Hope your friend enjoys it. Gorgeous! The color and shape are great. 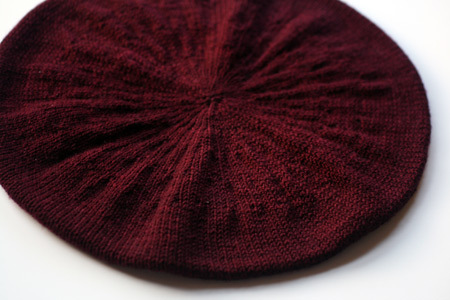 I just finished my Purl Beret 2 days ago. I wish I made it a little more floppy than the 4 inches. Yours looks great. For the first time, your photos showed up in Google Reader. I don’t know if that was an intentional move on your part, but I just wanted to say THANK YOU! Like many people, I read all my blogs through an aggregator and rarely visit the blogs themselves. I’m very happy that your photos are showing up. Ack, love! 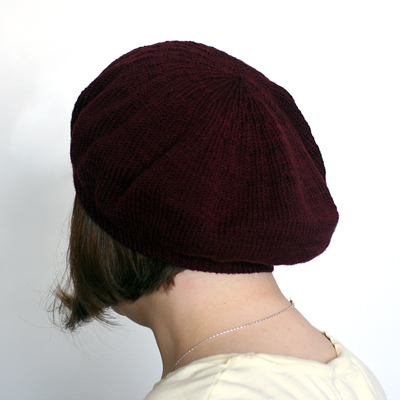 That color is amazing and it’s the exact perfect amount of slouch! Hmmm, now I want a beret, I’m so impressionable… I love that color, and it looks adorable on you, intended gift or not! Gorgeous!! YOU look fabulous in a beret…too bad it is a gift. Lovely! I’ve been wanting to get rid of some Koigu for awhile now. You’ve inspired me! You look fabulous in that beret. The color and the amount of slouch are just perfect. Great work! That yarn is gorgeous!. Glad you finally found the right pattern for the yarn. Hey! Great to see you. The beret looks great and you look GREAT in it! Parted ways….. how can you NOT like Koigu…. I know it’s been difficult, but the beret is gorgeous!!! Everything you do is gorgeous! WOW, now that is a beauty. Perfect in the scarlet colorway. Wonderful look for you! You’re giving that away? It’s so becoming on you! Beautiful! You look great in it too BTW. Lovely color. Glad you found the right project and needles for it, I’m sure your friend will love it. I love it! 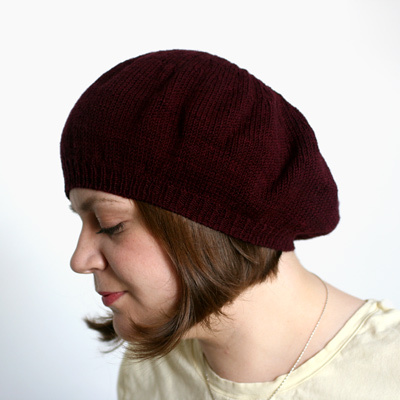 I’m not usually one for berets, but this one has me reconsidering! Stunning….I love the color and the fit. Thanks for showing us – I have quite the stash of Koigu – this seems like a worthy cause. i love this hat!! so cute on you! 🙂 That’s for the notes on how much you knitted because I’ve often thought about making this!! 🙂 CUTE! Fab-u-lous! You are a good person to be willing to give that away. I love this beret. And the photography. That’s a beautiful portrait of you. Just lovely! Lovely! I’ve been following your complaints about KPM with great concern. I’ve got two skeins that I’ve been wanting to make into socks. I’ve started them three times only to frog after a few inches. I too, couldn’t seem to get the right gauge. I think I will try the 3’s, they just seem so big next to the yarn. What wonderful pictures. The beret looks great, hope it looks as good on Friend. I love YOUR hat! What a beautiful color…you are an amazing friend for gifting such an awesome piece of work! This is gorgeous! I’m glad you found something that worked for you – I’ve never been able to make koigu work for socks either. I love it – great colour too. I have never used Koigu but now I just may. The beret looks great! You wear it well!